The Clean Beauty Box is “a themed monthly delivery of full size, clean, conscious and cruelty-free skin, hair and body care. Each product is carefully vetted with the intent to create a meaningful self-care experience, from unboxing to application. Working with both established and rising brands they help you discover the next cult favorites – all of whom are committed to using safe, high-quality and ethically-sourced ingredients. 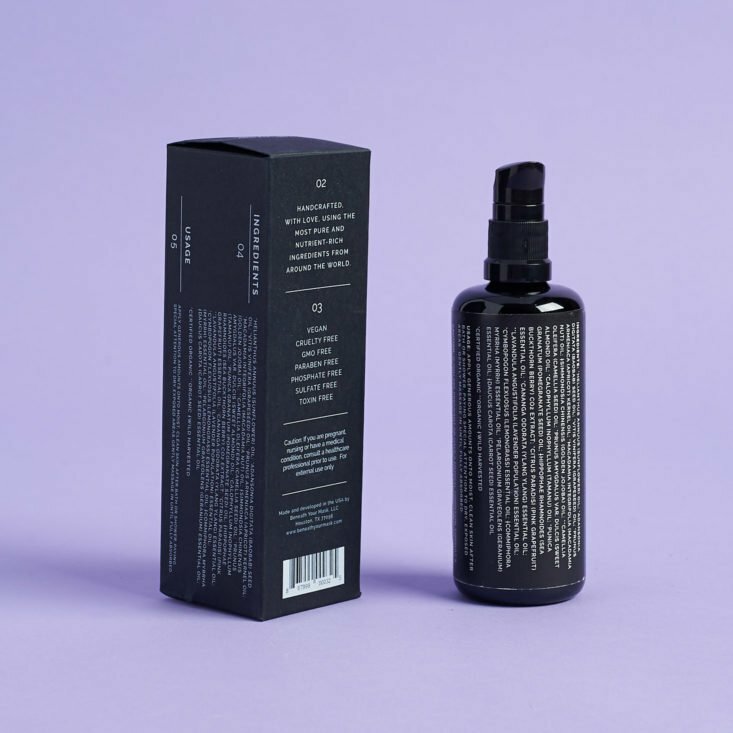 You’ll find an in-depth product information card and coveted brands like Laurel, de Mamiel, Kahina, Leahlani, and LILFOX”. The Cost: $41.95/month with free shipping (minimum commitment of 2 months, billed $83.90 every other month). The Products: 2 full sized organic, natural and cruelty-free beauty items. Ships to: U.S. for free and International for $15.00. You’ll find a booklet inside with the month’s theme which is “Indulge”. The Clean Beauty Box always features a new design each month on the box and info booklet. March was created by Fox & Follow out of Brisbane, Australia. Inside you’ll find an overview of the included products. As well as an introduction to the featured brand: Beneath Your Mask. The back explains that you enter to win your next box for free by tagging them in your photos of the box on Instagram. There’s also a 15% code for their online shop. This month has two products to discover! I was happy to see this generous full-size bottle of their body elixir which is like a facial oil for the whole body. The featured ingredients out of the total 18 pure plant oils and botanicals are baobab seed oil, white camellia seed oil, golden jojoba oil, pomegranate seed oil, and my fave: sea buckthorn berry CO2. It comes in a bottle with a pump top to dispense the right amount onto the skin. I started pumping it into my hands at first then rubbing on my legs and arms but decided it was easier to pump it directly on to the areas I wanted to cover. I’m used to using lotion on my body after showers so this is a treat to use this golden oil instead. It feels super luxurious and the smell is light and inviting. This absorbs well and softens the dryest areas like my shins, elbows, and even my mostly healed tattoo that needs extra hydration. The second product this month is for hair as well as the face. As much as I love a duo use product, I have learned not to mess too much with oil in my fine hair. I actually had success adding this sparingly to the ends of my dry hair to smooth things out, but didn’t have the same luck using it in wet hair all over before drying. Not so good for me. Probably great on those with thicker hair. Ahhh- one of the main ingredients here is my #1 scent of all time: lemongrass essential oil! Along with neem oil (which I keep hearing so many good things about) and hemp seed oil. Like most serums, this one comes with a dropper to apply the few drops needed. What I like about this one is that they put an emphasis on using this one on scars, rashes, and skin discoloration as well as stretch marks. Just one or two drops is plenty for my face, but you can of course use as needed for whatever areas you need a little boost of healing. Like the body elixir, this formula is also lightweight and absorbs quickly, only leaving soft skin behind. Verdict: I really enjoyed this month’s Clean Beauty Box! I was overjoyed to get some great scents in this box and the body oil was a special delight for me. Both products seem rich in helpful ingredients and they have more uses than the average serums which is awesome. These two products have a retail value of $116.00 which is fantastic for a box that costs $41. 95 all in. Can you still get this box if you sign up today? Yes, this box is still available! Make sure to check the sign-up page to make sure which box you’ll receive though. Check out all of our The Clean Beauty Box reviews and the Beauty Subscription Box Directory! What do you think of this month’s Clean Beauty Box?